Very similar to a TiVo, only works with radios. There are some very good radio shows out there, the kind that make you sit in the car long after you have reached your destination. The kind that you might schedule your day around if possible. A few of them are syndicated on NPR a few are locally produced, some are interesting talk, some are perspective, some are new music, etc. Wouldn’t it be great if you could time shift those shows and listen to them when you wanted to? Imagine this, you know that “This American Life” is airs on Saturday afternoon and it is a favorite. However, this Saturday you are busy working or what ever. 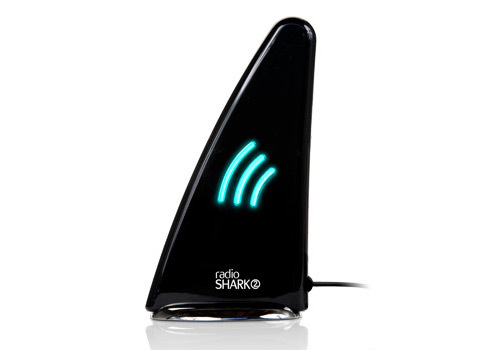 Go to the Radio Shark and program it to record your show, then listen to it later. What a concept. Plugs into PC or Mac USB port. Has AM and FM receivers built in. Can record programming and play back later, or pause programming and resume playback while recording. Not very portable, unless the user want to lug a lap top around. Does not integrate into cars or other playback devices, such as I-pods, etc. Does not record internet sources directly, although there are a few links to shareware on the Radio Shark website that will do this. This is a start, but what is really needed is something that is factory installed in cars. Say the Digital Audio Recording Device (DARD) can be in installed in the car, or in the house, or both. Then each DARD has a flash drive that can be moved from one unit to another, but only played back in DARD units (to thwart pirating music). It can even be an I-pod app. This is the type of new technology that will bring listeners to radio and make radio stations create good quality local content, stuff you can’t get anyplace else. Why aren’t these being marketed? Heck, radio stations should be giving them to listeners, I bet you could even get them manufactured with station logos. Seems like an opportunity lost to embrace some meaningful, understandable, young technology. Update: Okay, there are others out there as well. What needs to happen is all these features tied together and offered in stock car radios.